The highly-anticipated UFC 229 card takes place on Saturday night featuring perhaps the biggest match in UFC history at the top of the bill. The main event has lightweight champion Khabib Nurmagomedov defending his title for the first time against former two-division titleholder Conor McGregor. As of October 3, Online sportsbook. SBR has Nurmagomedov installed as the favorite. Nurmagomedov comes in at -165, meaning you’d need to wager $165 to win $100 and McGregor is +155, meaning if you bet $100, you’d net $155. The over/under on how many rounds the main event will go is set at 2 1/2 with the former originally coming in +118 and the latter at -133. Right now, Nurmagomedov (26-0) is the most dominant fighter in the UFC. You don’t go undefeated in 26 fights without having some type of talent. The name of the game for “The Eagle” is his grappling. Once he gets ahold of his opposition and drags them down to the mat, Nurmagomedov latches onto his opponents like a boa constrictor and makes them suffer to the point where they don’t want to continue. McGregor (21-3) returns to the Octagon for the first time since capturing the lightweight belt from Eddie Alvarez at UFC 205 in November 2016. He did compete in a boxing match in August 2017, losing by 10th-round TKO to Floyd Mayweather. This is the classic striker versus grappler matchup at its finest and it will come to down who can implement their plan of attack first. If anyone expects Nurmagomedov to become a world-class striker since he fought six months ago at UFC 223 when he beat Al Iaquinta to win the title, think again. McGregor won’t become an expert grappler on the level of Nurmagomedov, either. Can they be competent enough in their weaknesses? The smart money would be on McGregor being able to defend a takedown and if he does go down, he has the ability to get back to his feet. Yes, he did get taken down in the Chad Mendes bout at UFC 189, but he fought well off his back, engaged in a scramble off of an ill-advised submission attempt, got to his feet and blasted Mendes with his potent left hand to win the fight. Nurmagomedov has been wobbled by punches before, most notably when he faced Michael Johnson at the aforementioned UFC 205 and Iaquinta landed more than he should have. Nurmagomedov survived those encounters but their Iaquinta nor Johnson are remotely close to the Irishman in the striking department. Simply put, McGregor is the most lethal striker in MMA and one shot could end it all, as evidenced by Jose Aldo taking a canvas nap in 13-seconds at UFC 194. However, McGregor not fighting in almost two years is a bigger factor than people are making it out to be. Cage rust can be very real and McGregor isn’t known to have the best cardio in the Octagon. If Nurmagomedov can pressure him and get him to the mat, the 30-year-old will make it a long night for “The Notorious” one. There’s also the lingering factor that Nurmagomedov hasn’t faced top-level competition outside of beating Rafael dos Anjos back in April of 2014. McGregor is comfortable in this event setting and, whether anyone wants to admit it or not, being in a high stakes fight comes with the challenge of being able to handle everything around the event and keeping your emotions in check. McGregor seemed to get in the Dagestani’s head during the UFC 229 press conference two weeks ago. 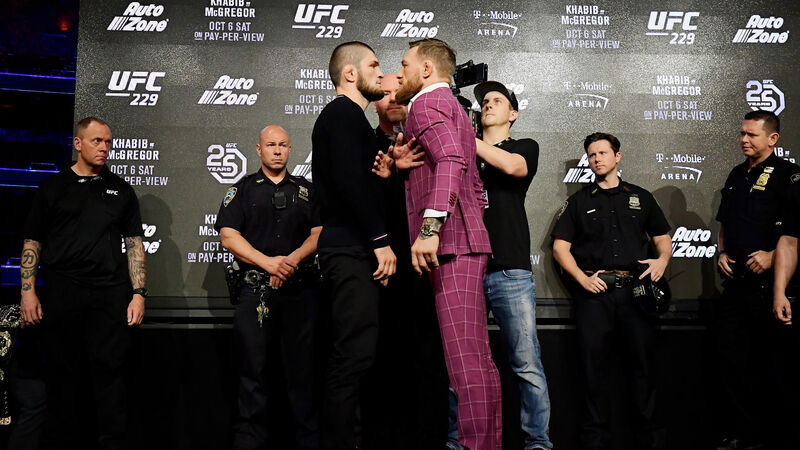 When it comes down to it, McGregor will defend his fair of Nurmagomedov takedown attempts to be able to keep the fight on the feet and blast the champion with his left hand and once again become the 155-pound and on top of the UFC throne.